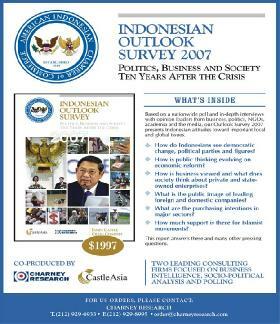 2007 was the 10th anniversary of the Asian Financial Crisis, a watershed event that continues to effect politics and economics in Indonesia. The country has made great strides to reform its politic al and economic systems in those 10 years, especially since 2004. However, attention in the US has generally been on disasters, terrorism, and instability rather than change. 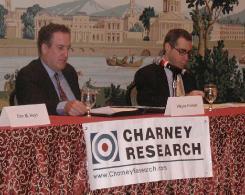 AICC organized events in NY, Washington, Atlanta, and Houston during 2007 where the results of a major survey by Charney Research and CastleAsia of Indonesian attitudes were presented. The discussions highlighted the dramatic changes in Indonesia in the 10 years since the Asian Financial Crisis of 1997-98 and the resignation of President Suharto. Rather than a preoccupation with whether or not their nation would hold together, Indonesians major concerns were with governance and the economy, the normal issues of a democracy. Indonesians are more positive today. Optimists outnumber pessimists 47% to 41%. Men and those living in urban areas tend to be more optimistic; Javanese tend to be more pessimistic. In politics, 34% view SBY as doing a good job in the presidency and 21% think he is doing a poor job. However, he is still the clear frontrunner for the 2009 election in which he is favored 53% to Megawati’s 30%. He retains an overall favorable image among the voters of 81%. Two thirds of Indonesians have an unfavorable opinion of the parliament (DPR). Among the political parties, the image of President SBY’s Democratic Party (PDI) is up, with the PDI-P of former President Megawati only one percentage point behind, and Golkar not far behind. However, the public image of the religious parties has diminished, despite the fact that around 50% of Indonesians have a favorable opinion of Muslim organizations Nahdlatul Ulama and Muhammadiyah. One troubling statistic is that 15% have a favorable opinion of Osama bin Laden; included in this number are many educated elite. 61% still believe the economy is doing poorly. 8% of respondents plan to buy a refrigerator within the next year, 23% plan to purchase a cell phone, and 20% plan to buy a motorcycle. Purchase intentions are very strong for a number of other products as well. Many of these new purchases are coming from the middle-class, showing a trickling down of wealth.